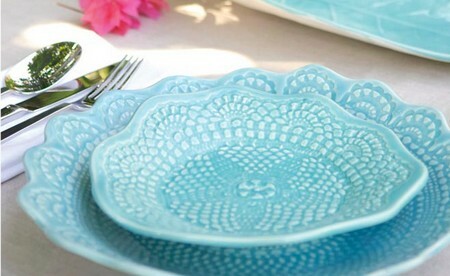 There is a fabulous choice of beautiful china, cutlery, and glassware in stores. With such a huge range of designs available, you can choose something that is practical and yet hardwearing for everyday use, and attractive enough for formal dining. Everyday china is often sold in complete sets. A 16-piece set will contain plates, side plates, bowls, and cups and saucers for four. To entertain formally, you’ll probably want to buy more, eight is a good number to keep. Items may be sold individually, or per place setting. Although popularly called china, crockery is made from a variety of materials. Your budget will be a big factor in your choice, but the following information should help you weigh up the options. Made from clay, which is dried, fired at a high temperature, and then glazed. It may chip and smash easily, but it is inexpensive to replace, and is dishwasher-proof. Made from china stone, this is china clay combined with up to 50 percent animal bone ash for added strength. It is fired at extremely high temperatures and has a beautiful translucent appearance. Hardwearing and resistant to chips and breaking, it will crack if dropped. It is expensive, so many people choose to save it for dining. Although it is dishwasher-proof, patterns on bone china will probably fade with repeated washing. Always check the manufacturer’s instructions. A mix of china clay, stone and silica sand, it is hardwearing and chip-resistant. 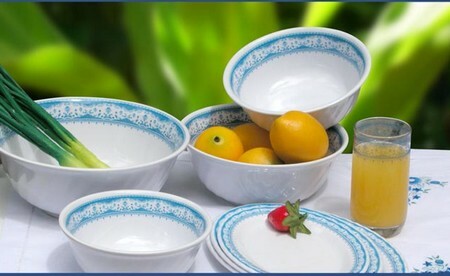 Used in quality everyday plates, most fine china products are dishwasher-proof. Made from china stone and clay, it is fairly hardwearing, but prone to chip. It is sometimes dishwasher-proof, but check this before buying. If you have a dishwasher, check that items are marked ‘dishwasher safe’. Before you buy, check that the pattern will not be discontinued. Reputable firms guarantee that a design will be produced for between two to ten years, leaving you time to add pieces. China-matching companies will track down discontinued designs. China manufacturers will be able to suggest companies that are selling their old stock. Ensure that dinner plates will fit inside kitchen cupboards. The largest plates may be too wide. Most plates are fine in a warm oven, but you need special ‘oven-to-tableware’ plates for cooking. A final rinse in a weak solution of water and vinegar will restore shine to china plates. Load dishwasher-safe china so the pieces are not touching, or they could chip. Never put metal-rimmed plates in the microwave. The underside of many plates is quite rough, so put a paper napkin between each special plate when you put them back in the cupboard. Cutlery comes in a range of fabulous designs, made from beautiful materials such as stainless steel and silver. However, choose cutlery that feels comfortable in your hands. Remember too, that you may love the design of a knife or spoon but it may not be practical for everyday use. Store silver cutlery in a chest, so that sharp prongs and edges can’t cause scratches. Always hand-wash items with wooden handles. Never leave stainless steel or silver in contact with any acidic products such as vinegar or lemon juice.